Trick out your '09-Current RAM Truck with this retro style Body Side "Strobe" graphics kit. This easy-to-install four (4) piece kit is packaged as PRECUT pieces which are ready to install in a wide variety of colors - NO TRIMMING required (slight trimming required for truck boxes equipped with RamBox Cargo Management System)! Select from one (1) of three (3) unique designs - Solid, 4x4 or add your own flair with unique custom lettering. Simply enter the Custom Wording of your choice (up to seven  letters/digits/spaces) and we'll make it happen. This kit is specifically made for the '09-Current Dodge Ram Truck and will not fit any other vehicle. Graphic is designed to follow the Ram's distinct body side lines as shown. 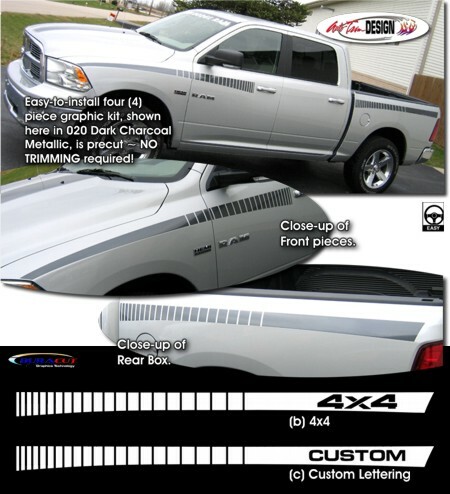 1Due to additional length of the Front Door and Rear Pickup Box specific to the RAM Regular Cab model, graphic pieces do not extend close to the Door Handle or Rear Pickup Box as shown on the RAM Quad Cab model in product image. 2Kit will not fit Ram vehicle models with Dually Rear Pickup Box.